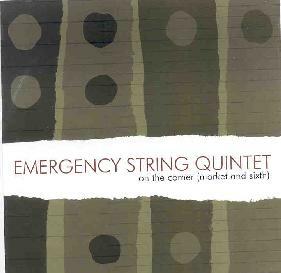 Emergency String Quintet - "On The Corner (Market and Sixth)"
Emergency String Quintet is a San Francisco based, all string, free-improv ensemble. The band consists of Jeff Hobbs and Kevin Van Yserloo on violins, Jonathan Fretheim on viola, Bob Marsh on cello, and Damon Smith on double bass. I had been introduced this past year to Hobbs work with the Electro-Magnetic Trans-Personal Orchestra and Left Coast Improv Group, and to Marsh, also in the Left Coast Improv Group and The Abstractions (see AI #21 for reviews of all). I love the use of string instruments in free-improv music and this a thoroughly enjoyable set, being a blend of chamber classical and Carl Stallings at his most creatively zany. There are four tracks ranging from 8 to nearly 20 minutes so the musicians really take the time to stretch out and develop the pieces. The music is highly expressive and always has a narrative feel, seamlessly evolving back and forth through slow paced delicate segments and faster, even frenzied sections. There are times when each musicians' contribution is distinct, and others when the strings come together in a more orchestral and even free-jazz style, and in these moments the double bass usually serves a rhythmic role or creates a low drone foundation upon which the rest of the ensemble builds increasing layers of emotion, intensity, and even good fun whimsy. The music flows so smoothly and the musicians seem so completely in communication with one another it would seem that much of this would have to be composed. In fact, I'm assuming that it's improvised based on the previous Marsh and Hobbs projects I've heard, though I'm blown away time and again when I confirm that such music really is improvised. (The credits do list Marsh as Director so the music may be improvised but with some discussion beforehand.) Recommended to all free-improv fans, especially if you're interested in something challenging but relatively accessible.